If you haven’t seen it yet, you should check out the October issue of The Highland Woodturner! In his column this month, Curtis Turner offers his strategies for doing woodturning demonstrations for the public. From showing off his spring pole lathe to providing a visual example of what happens to wood when it dries and everything in between, Curtis gives a great woodturning demonstration, and with his notes on how he does it, you can too! We’ve also got a great article on understanding and turning spinning tops by Federico Kuhlmann, some impressive wood turnings by Jeff Brockett (including a couple of wooden hats!) and a few more helpful ideas for how to use magnets around the shop from Phil Colson. Now go take a look and then get out to the shop and start turning! 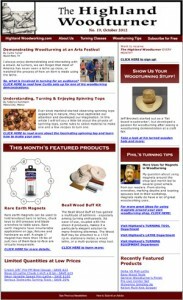 The Highland Woodturner October Issue is OUT!